On Thursday 29th January 2015 at 16.30, our ALCS member Dr Chris Joby (Hankuk University of Foreign Studies, Seoul) will launch his new publication The Dutch Language in Britain at the Dutch Church at Austin Friars. At this festive presentation the author will give a short introduction to the book, which will be available at a special discount. 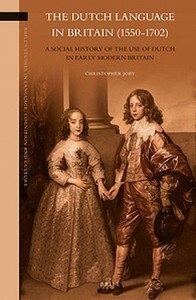 In The Dutch Language in Britain (1550-1702) Christopher Joby offers an account of the knowledge and use of Dutch in early modern Britain. Using extensive archive material from Britain and the Low Countries, Chris Joby demonstrates that Dutch was both written and spoken in a range of social domains including the church, work, learning, the home, diplomacy, the military and navy, and the court. Those who used the language included artisans and their families fleeing religious and economic turmoil on the continent; the Anglo-Dutch King, William III; and Englishmen such as the scientist Robert Hooke. Joby’s account adds both to our knowledge of the use of Dutch in the early modern period and multilingualism in Britain at this time. Kathleen's latest historical novel, Margareta, portrait of an enigmatic artist and sister of Hubert and Jan Van Eyck.